Your complete User’s Guide is always available with the touch of a finger. Just download the JoyOS Advisor App onto your phone or tablet, and your free mySewnet cloud account will provide automatic updates and easy mobile access to project files via wifi, wherever you are. Developed by optronic experts, the working area involves a number of powerful LEDs mounted on the light module for a uniquely bright sewing experience that virtually eliminates shadows and blind spots. 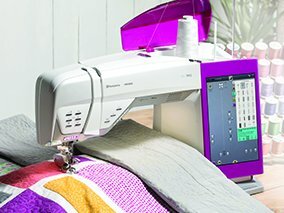 With one touch of a button your needle is threaded and ready to sew. Another way you'll get from "idea to done" in no time.